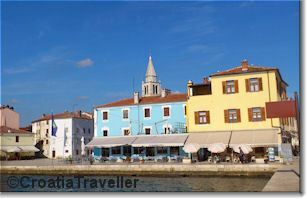 Fazana is a small town and fishing port located on Istria's Fazana Strait, 8km northwest of Pula. Although there are no beaches, the town has a low-key tourist business as it's the embarkation point for boat trips to the Brijuni Islands National Park. Fazana is also a good place for a relaxing holiday as it's far enough away from the far busier resorts of Pula to provide a more authentic Istrian experience. It still has a thriving fishing industry, vineyards flourish in the surroundings and the town retains a traditional medieval look. There are several interesting churches including the church of St Elys from the 6th century, the 14th century church of Our Lady of Mount Carmel and the Gothic Sts Cosmas and Damian church with traces of Renaissance frescoes in the sacristy. Arriving at Pula airport, it's easy to take a taxi to Fazana as it's only 12km from the airport. Otherwise, buses from Pula to Fazana run about every hour. See more on getting to Pula. The Fazana tourist office (tel 052 383 727) is at 43 Istarske Divizije 8.